Brain-on-a-chip; increasing manufacturing reliability; biodegradable sensors. In the emerging field of neuromorphic computing, researchers are attempting to design computer chips that work like the human brain, which, instead of carrying out computations based on binary, on/off signaling like digital chips do today, the elements of a brain-on-a-chip would work in an analog fashion, exchanging a gradient of signals much like neurons that activate in various ways depending on the type and number of ions that flow across a synapse. In this way, small neuromorphic chips could — like the brain — efficiently process millions of streams of parallel computations that are currently only possible with large banks of supercomputers. One significant challenge on the way to such portable artificial intelligence has been the neural synapse, which has been particularly tricky to reproduce in hardware. However, engineers at MIT reported that they have designed an artificial synapse in such a way that they can precisely control the strength of an electric current flowing across it, similar to the way ions flow between neurons. The team has built a small, silicon germanium-based chip with artificial synapses. In simulations, the researchers say the chip and its synapses could be used to recognize samples of handwriting with 95 percent accuracy. They assert this is a major step toward building portable, low-power neuromorphic chips for use in pattern recognition and other learning tasks. As a final test, the team explored how the device would perform if it were to carry out actual learning tasks — specifically, recognizing samples of handwriting, which researchers consider to be a first practical test for neuromorphic chips. Such chips would consist of “input/hidden/output neurons,” each connected to other “neurons” via filament-based artificial synapses. They ran a computer simulation of an artificial neural network consisting of three sheets of neural layers connected via two layers of artificial synapses, the properties of which they based on measurements from their actual neuromorphic chip. They fed into their simulation tens of thousands of samples from a handwritten recognition dataset commonly used by neuromorphic designers, and found that their neural network hardware recognized handwritten samples 95 percent of the time, compared to the 97 percent accuracy of existing software algorithms. The team is now in the process of fabricating a working neuromorphic chip that can carry out handwriting-recognition tasks, not in simulation but in reality. Beyond handwriting, the team said this artificial synapse design should enable much smaller, portable neural network devices that can perform complex computations that currently are only possible with large supercomputers. Ultimately they want to create a chip as big as a fingernail to replace one big supercomputer. With intense optimization pressure on the floors of motor vehicle manufacturers’ factories, variance has been steadily increasing, while costs must be contained. 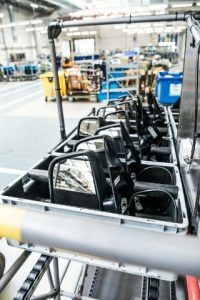 Fraunhofer researchers are now using RFID technology to introduce more transparency in motor vehicle manufacturers’ supply chains and manufacturing operations in order to reduce time and labor, and boost cost effectiveness as a result. With the variety of options for new automobiles constantly growing, this customization entails major challenges for carmakers. Outwardly, many parts are virtually indistinguishable to workers – a seatbelt for German cars looks remarkably like one for non-EU cars. That is why safety-related parts are given barcodes, which require manual scanning. In the course of digitization, RFID is freeing employees from this routine task, while automatic inspection simultaneously gives them certainty that they have installed the correct parts. Fraunhofer Institute for Factory Operation and Automation IFF researchers in Magdeburg, Germany are readying manufacturing and supply chain operations for digitization and Industrie 4.0 respectively. These RFID systems consist of RFID tags on parts and a scanner that reads out information optically. In a first step, the researchers analyzed which of the numerous vehicle parts are best suited for this and identified as many as forty parts. For the start, the experts focused on mirrors and seats for further developments. The RFID tags are affixed to every single safety-critical part, individual mirrors for instance. Much like barcode, a serial number is stored on the tags, the major difference being that, whereas barcode merely stores information identifying the type of mirror the number on an RFID tag delivers abundant information such as the vehicle in which a mirror is to be installed. Whereas barcodes have to be read manually with a handheld scanner one by one, RFID tags can all be read automatically and optically at the same time by one scanner – even when the parts have been installed. This means that information can be retrieved from RFID tags in seconds at any given time. This is a crucial advantage for manufacturing. For instance, the installation of all the requisite parts can be verified while a front or rear axle is being mounted. Previously, this was not checked until final inspection – by employees conducting visual inspections and using paper lists. The researchers from the Fraunhofer IFF delivered both the technology and the operating specifications. With Mercedes-Benz, they reduced the blind spots in production scheduling, ad thought through different roles. A project manager ultimately needs different information than a technician, Kujath added. University of Connecticut engineers have created a biodegradable pressure sensor that could help doctors monitor chronic lung disease, swelling of the brain, and other medical conditions before dissolving harmlessly in a patient’s body. 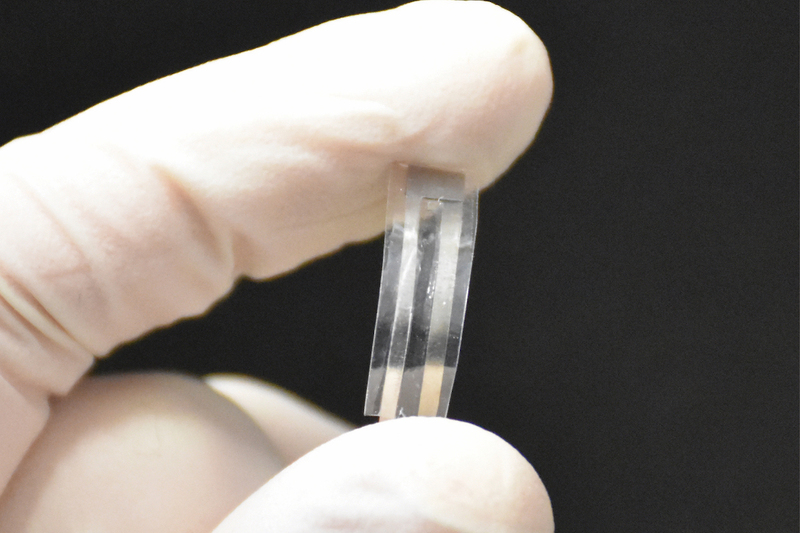 The small, flexible sensor is made of medically safe materials already approved by the U.S. Food and Drug Administration for use in surgical sutures, bone grafts, and medical implants. It is designed to replace existing implantable pressure sensors that have potentially toxic components. Those sensors must be removed after use, subjecting patients to an additional invasive procedure, extending their recovery time, and increasing the risk of infection. Because the UConn sensor emits a small electrical charge when pressure is applied against it, the device also could be used to provide electrical stimulation for tissue regeneration, researchers say. Other potential applications include monitoring patients with glaucoma, heart disease, and bladder cancer, the team said. The project’s key breakthrough came when they discovered how to transform the PLLA into a piezoelectric material by carefully heating it, stretching it, and cutting it at just the right angle so that its internal molecular structure was altered and it adopted piezoelectric properties. The sensor was then connected to electronic circuits so the material’s force-sensing capabilities could be tested. The team is investigating ways to extend the sensor’s functional lifetime. The lab’s ultimate goal is to develop a sensor system that is completely biodegradable within the human body. Until then, the new sensor can be used in its current form to help patients avoid invasive removal surgery, the researchers say.